Dr. Tanaz Kermani is the Director of the Vasculitis Program at UCLA. She grew up in Mumbai and moved to the United States in 1996 after graduating high school to pursue higher education. She completed her training in Internal Medicine, Rheumatology at the Mayo Clinic in Minnesota. 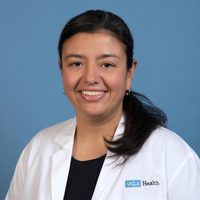 She joined the UCLA Health's Division of Rheumatology in 2012. She sees patients with all rheumatological diagnoses and has a special interest and expertise in vasculitis. She completed additional training in vasculitis at the Mayo Clinic, as part of a prestigious Vasculitis Clinical Research Consortium fellowship. She has expertise in vascular ultrasound for evaluation of patients with suspected giant cell arteritis. She is an active member of the vasculitis research community, with multiple ongoing national and international collaborations with vasculitis patient advocates and medical experts. She has published several vasculitis research studies. Dr. Kermani is deeply concerned and invested in the well-being of her patients. Her approach is to listen to her patients, and provide them with the best treatment options so she and the patients can make joint decisions concerning the best way to proceed. Kermani TA, Matteson EL, Hunder GG, Warrington KJ. Symptomatic lower extremity vasculitis in giant cell arteritis: a case series. J Rheumatol. 2009;36(10):2277-83. PMID:19755612. Kermani TA, Warrington KJ, Crowson CS, Ytterberg SR, Hunder GG, Gabriel SE, Matteson EL. Large-Vessel Involvement in Giant Cell Arteritis: A Population-Based Cohort Study of the Incidence-Trends and Prognosis. Annals of the Rheumatic Diseases, December 2013;72:1989-1994. PMID: 23253927. Kermani TA, Crowson CS, Muratore F, Schmidt J, Matteson EL, Warrington KJ. Extra-cranial giant cell arteritis and Takayasu arteritis – How similar are they? Seminars Arthritis Rheum. 2015;44:724-8. PMID: 25712813. Muratore F, Kermani TA, Crowson CS, Green AB, Salvarani C, Matteson EL, Warrington KJ. Large-Vessel giant cell arteritis: a cohort study. Rheumatology (Oxford) 2015;54:463-70. PMID: 25193809. Kermani TA, Warrington K, Crowson C, Hunder G, Ytterberg S, Gabriel S and Matteson E. Predictors of dissection in aortic aneurysms from giant cell arteritis: A population-based study of predictors. Journal of Clinical Rheumatology. 2016;22(4):184-7. PMID:27219304. Kermani TA, Schafer VS, Crowson CS, Hunder GG, Gabriel SE, Ytterberg SR, Matteson EL, Warrington KJ. Malignancy risk in patients with giant cell arteritis: a population-based cohort study. Arthritis Care Res (Hoboken). 2010;62(2):149-54. PMID:20191512. PMCID:2874240. NIHMS:191295. Kermani TA, Schafer VS, Crowson CS, Hunder GG, Ytterberg SR, Matteson EL, Gabriel SE, Warrington KJ. Cancer preceding giant cell arteritis: a case-control study. Arthritis Rheum. 2010;62(6):1763-9. PMID:20191583. PMCID:2908278. NIHMS:218601. Schafer VS, Kermani TA, Crowson CS, Hunder GG, Gabriel SE, Ytterberg SR, Matteson EL, Warrington KJ. Incidence of herpes zoster in patients with giant cell arteritis: a population-based cohort study. Rheumatology (Oxford). 2010;49(11):2104-8. PMID:20627970. PMCID:2981027. Kermani TA, Ytterberg SR, Warrington KJ. Pneumocystis jiroveci pneumonia in giant cell arteritis: A case series. Arthritis Care Res (Hoboken). 2011;63(5):761-5. PMID:21240966. PMCID:3091984. NIHMS:263495. Singh A, Kermani TA, Crowson CS, Weyand, CM, Matteson EL, Warrington KJ. Visual Manifestations in Giant Cell Arteritis: Trend over Five Decades in a Population-based Cohort J Rheumatol. 2015;42:309-15. PMID: 25512481. Kermani TA, Warrington KJ, Cuthbertson D, Carette S, Hoffman GS, Khalidi NA, Koening CL, Langford CA, McAlear CA, McKinnon-Maksimowicz K, Monach PA, Seo P, Merkel PA, Ytterberg SR. Disease relapses among patients with giant cell arteritis: A prospective, longitudinal, cohort study. J Rheumatol. 2015;42(7):1213-7. PMID:25877501. Direskeneli H, Aydin SZ, Kermani TA, Matteson EL, Boers M, Herlyn K, Luqmani RA, Neogi T, Seo P, Suppiah R, Tomasson G, Merkel PA. Development of outcome measures for large-vessel vasculitis for use in clinical trials: opportunities, challenges, and research agenda. J Rheumatol. 2011;38(7):1471-9. PMID:21724719. Kermani TA, Cuthbertson D, Carette S, Hoffman GS, Khalidi NA, Koening CL, Lanford CA, McKinnon-Maksimowicz K, McAlear CA, Monach PA, Seo P, Warrington KJ, Ytterberg SR, Merkel PA, Matteson EL. The Birmingham Vasculitis Activity Score as a measure of disease activity in giant cell arteritis. J Rheumatol. 2016;43(6);1078-84. PMID:27036388. Kermani TA, Sreih AG, Cuthbertson D, Carette S, Hoffman G, Khalidi N, Koening C, Langford C, McAlear C, Monach P, Moreland LW, Pagnoux C, Seo P, Warrington K, Ytterberg S, Merkel P. Evaluation of Damage in Giant Cell Arteritis. Rheumatology (Oxford). In Press. Mackie SL, Twohig H, Neill LM, Harrison E, Shea B, Black RJ, Kermani TA, Merkel PA, Mallen C, Buttgereit F, Mukhtyar C, Simon LS, Hill CL. The OMERACT Core Domain Set for Outcome Measures for Clinical Trials in Polymyalgia Rheumatica. J Rheumatol. 2017 Aug 1 [E-pub]. Sreih A, Alibaz-Oner F, Kermani TA, Aydin SZ,Cronholm, Peter, Davis T, Easley E, Gül A, Mahr A, McAlear C, Milman N, Robson J, Tomasson G, Direskeneli H, Merkel PA. Development of a Core Set of Outcome Measures for Large-Vessel Vasculitis: Report from OMERACT 2016. J Rheumatol. In Press. Kermani TA, Warrington KJ. Lower extremity vasculitis in polymyalgia rheumatica and giant cell arteritis. Curr Opin Rheumatol. 2011;23(1):38-42. PMID:21037479. PMCID:3085840. NIHMS:287503. Kermani TA, Warrington KJ, Amin S. Malignancy risk in vasculitis. Therapeutic Advances in Musculoskeletal Disease. 2011;3(1):55-63. PMID:22870466. Kermani TA, Warrington KJ. Recent Advances in Diagnostic Strategies for Giant Cell Arterties. Curr Neurol Neurosci Rep. 2012;12(2):138-44. PMID: 22205235. Kermani TA, Warrington KJ. Polymyalgia rheumatica. The Lancet. 2013;5:381:63-72. PMID 23051717. Kermani TA and Warrington KJ. Advances and challenges in the diagnosis and treatment of polymyalgia rheumatica. Therapeutic Advances in Musculoskeletal Diseases. 2014;6:8-19. PMID: 24489611. Koster MJ, Warrington KJ, Kermani TA. Update on the Epidemiology and Treatment of Giant Cell Arteritis. Current Treatments in Rheumatology. In Press.